It’s great to be home from the road. Our almost-five-week Summer Tour went well- wonderful to see friends and familiar faces up north in Ohio, Indiana, West Virginia, and Kentucky. The Cincy Blues Festival was a high point for us, sharing the Arches Piano Stage with Ann Rabson, Henry Butler, Ricky Nye, Rudy Blue Shoes, Big Joe Duskin, Todd Hepburn, Craig Brenner, Bob Seeley, Mr. B., Henry Gray and others. The Atwood Yacht Club said they had the best crowd ever. We were totally surprised when Barry Mellitz, our fan from Connecticut, walked into our show at the Parkersburg Moose Lodge in West Virginia. Check out our GALLERY page for new tour photos. We are heartbroken by the catastrophic effects of Hurricane Katrina in New Orleans and Mississippi, the birthplace of jazz and blues. We will be a part of a Benefit Concert at the Ringside Cafe in St. Pete on Tuesday, September 13th. Many of Tampa Bay’s best musicians will also be performing at this benefit. Regrettably, after a successful public reading on May 16th, the theatrical production on the life of Diamond Teeth Mary has been halted due to the dissolving of the Live Arts Peninsula, who had planned to produce the play. However, New York playwright Levy Lee Simon and many of us here are hopeful that his play will be produced by another venue. Also, we continue to work on material for our next CD. Two of our brand new songs, “Etta Kitt” and “Taxi Driving Woman”, were well-received on the tour. We were shocked and saddened when we got the news on the road that our friend Lovey Rochester passed away August 19th. We will surely miss her enthusiastic spirit at the gigs, and our deepest sympathy goes out to her twin sister Dovey and family. Florida DOES get cold in the winter, especially when you’re playing outside gigs & the temp is below 40! Our fans were truly loyal as they bundled up & braved the chill for some blues! April & May have been unusually cool too, which is great- windows open & no A/C yet. Spring has found us playing a number of beach gigs, such at the KATIKI (Sunset Beach) every Sunday and SUNSET BAR & GRILL (St. Pete Beach) on many Saturdays. Great sunsets! The DIAMOND TEETH MARY play is progressing nicely, and the New York playwright LEVY LEE SIMON is in town this weekend for a first public reading of the play. The reading is scheduled for Monday, May 16th, and we’ll be providing the music behind the singers. As the play takes form for the stage, it’s an exciting trip down “memory lane” for Liz and me after twelve years of performing with Mary. The play is scheduled for opening in either the fall or winter. We’re also excited about a new CD release from ANDRA FAYE, one of the members of SAFFIRE: THE UPPITY BLUES WOMEN. Andra has recorded one of Liz’s songs, “TAKE IT SLOW,” on this new release, which is the first time one of Liz’s songs has been recorded by a national artist. For more information or to order this CD, check out ANDRA FAYE’S website on our LINKS page (www.andrafaye.com). Liz & I will be traveling to Tallahassee on Saturday, July 2nd to perform at the FLORIDA BLUES CELEBRATION for the Florida Museum of History. Other blues notables who will be playing at the festival include SARASOTA SLIM and blues harpist T.C. CARR. This promises to be a memorable event. Well, our supply of motel soap is dwindling, so it must be time to tour again. The Summer tour will begin the last week of July and will run through August 25th. Our DATES page lists the gigs booked so far, but check it for updates to see when we’ll be in your area. Come on out to a show or two- we’d love to see ya! As always, much thanks to those of you who come out to the shows and buy CDs- you keep us going and inspired! Merry Christmas and Happy Holidays! Another year is coming to a close, but this Autumn has been an exciting one for us. Liz & I flew to Ohio the week of Halloween to play for her niece’s wedding in Lebanon, Ohio. So good to see all the relatives, and Alicia’s & Elijah’s wedding was great; our good friend and blues photographer, LES GRUSECK, took the photos, and we had a chance to visit Les, his wife Lilia, and their daughter Maya in Florence, Kentucky for a few days. On Monday, November 1st, Liz & I performed for Blues In The Schools in Cincinnati; thanks to TODD HEPBURN and The Cincy Blues Society for putting this together. We then split a gig with Cincy piano master RICKY NYE at Chez Nora in Covington, Kentucky on November 3rd before returning home to Florida. Thanksgiving found us flying to Belgium where we performed at the BRUSSELS BOOGIE WOOGIE PIANO SUMMIT on November 27th. Liz & I shared the bill with RENAUD PATIGNY (Belgium’s “King of Boogie Woogie”), CHRISTOPH ROIS (Vienna, Austria), and CAROLINE DAHL (San Francisco) at Theatre St. Michel, a gorgeous old theatre with two Yamaha grand pianos onstage. The enthusiastic audience of 1,300+ received us well, and we also did a couple songs with Brussels blues harpist GENEVIEVE DARTEVELLE. You can view photos from the festival on our PHOTOS page. Many thanks to Renaud Patigny for having us perform! Liz and I had a chance to sightsee in downtown Brussels (at the Grand Place) on Sunday and sample the fine waffles, chocolate, beer, and other Belgian cuisine before leaving on Monday. Brussels is an absolutely beautiful city, and we truly hated to leave. Our sympathies go to fellow musician TOMMY McCOY on the sudden loss of his girlfriend, BRENDA. We also mourn the loss of 2 dear fan/friends: MORGAN CUMMINGS of Crystal River and just got word that singer/songwriter MIKE LOREN passed last night. It’s hard to lose friends our age & we’ll miss seeing them in the audience. Life is short and as Morgan said, “Keep the faith and seek the light.” We so appreciate every one of you & hope to see you often in 2005. Happy New Year! As I write this on Sunday, September 5th, we’re hunkered down at home in St. Pete riding out Hurricane Frances, the largest hurricane diameter-wise in recorded history. So far, there’s been lots of wind and rain, but no major property damage in our area. This was quite a stormy homecoming after our five-week Summer Tour, but we’re really glad to be home! Our 2004 tour took us to shows in Ohio, West Virginia, Indiana, and Tennessee. This was our tenth year at the Cincy Blues Festival (Cincinnati, Ohio), and the rainy weather cleared in time for our 6 PM performance. Liz & I truly enjoyed seeing so many of our friends and fans there, and we had a great time staying with our good friends Les & Lilia Gruseck and their daughter Maya. While at Gruseck’s, we had the chance to get together with our pal Roy Book Binder, his wife Nancy and her sister Maureen; we also had a cookout there with our friends Dave Warford, Mary Ann Kindell, and Dilip Tripithy, courtesy of the Grusecks. Check out the new Cincy 2004 pics on our GALLERY page. Liz and I did two shows at the Canal House Tavern in Tuscarawas, Ohio- our first time there. It turns out the owner is Liz’s second cousin, so it was a reunion of sorts. One of the joys of touring is playing in familiar towns where we reunite with old friends and fans. Liz and I had a nice time at our Slippery Noodle show in Indianapolis, where we saw friends Stephanie Griffin, Jim & Kate Kirk, and Jack Bailey, who graciously put us up for the night in his beautiful home (Thanks, Jack). Also, we had a great two nights at the Marietta Brewing Company in Marietta, Ohio (our old stomping grounds) and at Court Grill (Pomeroy, Ohio), where we reunited with many friends from Southeastern Ohio & Parkersburg, West Virginia. Further, we did two shows at Wild Bill’s New American Grill in Lebanon, Ohio, where we stayed with Liz’s sister Mary and her family. Liz & I played at Brackins Blues Bar in Maryville, Tennessee for the first time on August 27th (this is a fine blues club with a nice stage & house PA). The Maryville Daily Times did a story on us prior to the gig. We then headed south to Chattanooga, Tennessee for our gig at The Tropicana Room (where we saw our good friend, Dr. Russell Linneman- the “blues doctor”) before heading home. On Friday, Just before Hurricane Frances hit, Liz & I played our homecoming gig at Dave’s Aqualounge to a great crowd of familiar faces. Among the new songs that we’re now doing is “Straight At Me”, a new tune by our friend Terry Gregory (music by Liz). This new song was well-received on our tour, and people are finding it quite danceable. Liz also has a new original entitled “Last Song”; both of these songs will be on our next album. Further, we’ve introduced our new logo-embroidered blues berets, which come in four colors and are available at our shows. 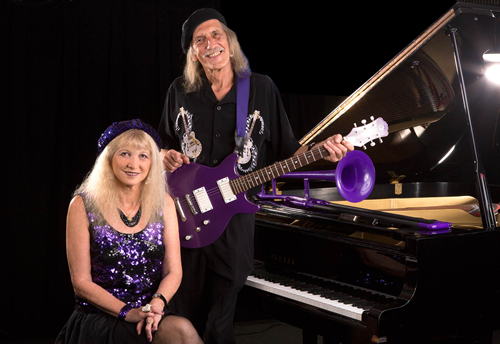 Among our other upcoming Florida gigs, Liz & I will be performing at the Jazz-Up Dunnellon Festival on September 25th, The Seminole Hard Rock Hotel/Casino (Tampa) on September 13th, and at Classic Wax in Sarasota on September 17th. Please check our DATES page for details. Also, we’ll be going to Brussels, Belgium in late November to play at the Brussels Boogie-Woogie Festival. That’s all for now- Hope to see you at a show soon and thanks to all who made our tour wonderful! Happy New Year, Everybody! Hope the holidays treated you well. 2003, the Year Of The Blues, turned out to be a great year for us, particularly with the release of LIVE FROM ST. PETE. Thanks to all who have purchased this and our other albums. December was a busy month for us. In early December, we performed in Indianapolis at the annual meeting of the Wabash Valley Power Company, followed by a trip to the Slippery Noodle in Indy, where we played at their Wednesday night Jam Session. It was a wonderful three days, but we were glad to get back to sunny Florida. John Hammond, one of America’s great acoustic blues artists, showed up at our Caspy’s gig on December 18th following his concert in Gulfport and sat in with Liz on a few songs- quite a treat! We actually hadn’t seen John since we opened for him in 1989 in Marietta, Ohio (see photo in our GALLERY)- great to see John and Marla again. Thanks to all who joined us New Year’s Eve at the Peninsula Inn in Gulfport. Sax player Mike Delaney performed with us, and it was a good place to ring in the New Year. We attended our good friend Roy Book Binder’s Birthday Bash in Gulfport in January, where most of the Tampa Bay’s blues luminaries were in attendance, including Norwegian guitar legend Vidar Busk. Check out Roy’s website (on our LINKS page) when you get a chance- he could be playing in your area soon. If you’re in the Tampa Bay area, please stop in at a show and say hello. Our DATES schedule is kept current daily.